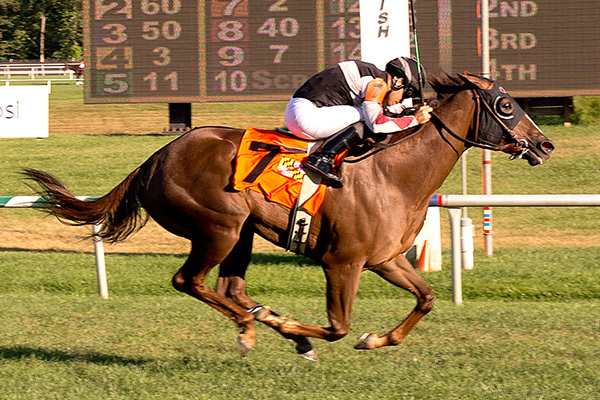 LAUREL, MD – Second in three of four starts this year including a pair of local stakes, Sagamore Farm homebred Ginger N Rye looks to break through with her first black-type victory in Saturday’s $150,000 Lady Baltimore at Laurel Park. The 45th running of the Lady Baltimore for fillies and mares 3 and up at 1 1/16 miles on the grass is the richest of six stakes worth $575,000 on the 11-race Laurel Turf Cup program. Other grass stakes on the card are the $100,000 Laurel Dash for 3-year-olds and up going six furlongs and featuring 26-time stakes-winning multimillionaire Ben’s Cat; the $100,000 Laurel Turf Cup for 3-year-olds and up at 1 ½ miles; and the $75,000 Laurel Futurity for 2-year-olds and the $75,000 Selima for 2-year-old fillies, both 5 ½-furlong turf sprints. They are joined by the $75,000 Shine Again for 3-year-olds and up at seven furlongs on the main track. Ginger N Rye, a 4-year-old daughter of More Than Ready, returns to a Laurel turf course where she has three wins and three seconds from nine career starts. She was beaten a half-length after being in tight quarters early in the Dahlia Stakes April 16, and came up a head short as the favorite in the All Brandy Stakes June 25. “We’d like to win it for her,” trainer Horacio DePaz said. “I still have her two-other-than condition, and I would have liked to run her in that condition and then run her in a stake to build her up and kind of get her some confidence; not that she’s not doing right, but just to take advantage of that condition. DePaz took Ginger N Rye to Saratoga Race Course off her All Brandy effort and she was dead game in an open second-level optional claiming allowance going one mile, holding the lead past the eighth pole before giving way late to lose by a head. She has breezed three times since that July 24 race, most recently going a half-mile in 49 seconds Sept. 3 at Laurel. Trevor McCarthy will ride from post 3 of eight at 118 pounds. Among Ginger N Rye’s rivals in the Lady Baltimore is New York shipper Robillard, trained by Kiaran McLaughlin for Godolphin Racing. The 4-year-old Distorted Humor filly is also seeking her first stakes win, having run third in the Sheepshead Bay (G2) May 7 at Belmont Park. Last time out, Robillard sat just off the pace on the outside but encountered traffic trouble at the three-sixteenths pole and weakened to finish sixth in the De La Rose Stakes Aug. 6 at Saratoga. She was a gate-to-wire winner of an optional claiming allowance at the Lady Baltimore distance June 23 at Belmont. Jevian Toledo, coming off Laurel’s summer meet title, has the call from outside post 8 at 118 pounds. Drawing the rail is Charles J. Reed’s multiple stakes winner Monster Sleeping, making her fourth start of the year and third straight in stakes company. She was fourth, beaten 1 ¼ lengths in the All Brandy and third after having to steady and being carried out in the six-furlong Jameela Aug. 20 at Laurel. Rounding out the field are Catcha Rising Star, a winner of two straight including the West Virginia Senate President’s Cup Stakes Aug. 6 at Mountaineer; Onus, who captured the Commonwealth Oaks (G3) last fall at Laurel; 2016 Santa Ana (G2) winner Tuttipaesi; Vielsalm, runner-up in the Gallorette (G2) May 21 at Pimlico; and McArthur Parkway. Release courtesy of Laurel Park.